Mohonk Mountain House - a retreat for your mind, body and spirit. I recently had the good fortune to spend a few days at Mohonk Mountain House in New Paltz, New York. Ever since, I've been telling friends and family that Mohonk deserves a spot on everyone's "must experience" list. 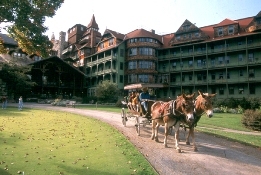 The Mohonk experience begins as you drive on the resort's entrance road. Signs reading "Slowly and Quietly Please", while meant to encourage cautious driving, also communicate the resort's overall philosophy. This is a place where you do yourself a great disservice if you don't allow yourself to slow down and really take in and appreciate the surroundings. As we rounded the bend near the end of the entrance road, the sight of the Victorian castle before us elicited enthusiastic "oohs" and "cooools" from my 5 year old. Upon entering the Mountain House, I was immediately struck by the impressive woodwork and old world feel and charm of the building. A walk through the main building leads to the outdoor covered porches that provide a stunning view of Lake Mohonk and the beautiful grounds and rock formations that rise from the edge of the lake. Throughout our stay, we found ourselves drawn to this spot just to relax on a rocking chair and take in the natural beauty of the resort. One of the highlights of my stay at Mohonk Mountain House was the afternoon I spent at Mohonk's eco-friendly spa. I opted for the Heavenly Head & Shoulders massage treatment, but what I got was a complete spa experience. From the time I donned the spa robe and slippers and entered the women's veranda overlooking the breathtaking landscape, I immediately felt my body begin to relax. My spa treatment was just one piece of the overall experience. I enjoyed time outside in the spa's heated mineral pool and read a book in the window-walled solarium while I munched on grapes and sipped a pear elixir. I spent about 3 hours in the spa and emerged feeling relaxed and rejuvenated. While my trip to Mohonk wasn't actually a babymoon, I did have an opportunity to learn about Mohonk's increasingly popular Hello Baby! babymoon package. According to Nina Smiley, Director of Marketing at Mohonk, the babymoon package has been offered for about 2 years. Based on babymooner feedback, the most popular amenity in the package is the side-by-side couples spa treatment. Smiley reports that many couples use the maternity massage as a learning experience with the massage therapist showing dad-to-be how to massage his partner to help alleviate some of the discomforts of pregnancy. 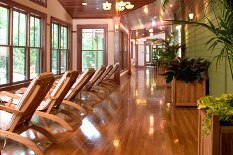 Afterwards, the couple can relax together in the co-ed veranda or solarium. According to Smiley, here are the top "must do" things for couples babymooning at Mohonk. 1. The spa – In addition to pregnancy massage, The Spa at Mohonk offers several other treatments that are customized to the unique needs of pregnant women including facials, manicures and pedicures (without heat). 3. Breakfast in Bed – Have your breakfast delivered to your room. Many of Mohonk's rooms have woodburning fireplaces and balconies so you can enjoy your breakfast with a great view. 4. Gardens – Take a stroll through Mohonk’s award-winning gardens and be sure to check out the garden maze too. 5. Evening entertainment – On most evenings, there is some type of entertainment. Take advantage of an evening out while you can, without having to worry about a babysitter! 6. Boat ride – Take a peaceful boat ride on Lake Mohonk. Choose from a paddle boat, row boat or canoe to explore the lake. 7. Summerhouses – Walk or hike (Mohonk has over 85 miles of hiking trails) to one of 125 summerhouses (rustic gazebos) where you can sit and enjoy magnificent vistas while you read a book or just share time together. 8. Fitness classes – Choose from Yoga, Meditation, Pilates and more. Instructors will tailor most classes to the needs of pregnant women. 9. Indoor pool – The huge indoor pool is heated to a temperature that is safe for pregnant women and contains an underwater sound system for total relaxation. The pool is surrounded by comfortable lounges and a wall of windows overlooking the resort grounds. It's a great place to hang out for a while. 10. Ice-skating – Yes, ice skating can be risky when you're pregnant, but Mohonk has that covered! In winter, the gigantic open-air ice skating rink houses several Victorian skating chairs so dad can safely push mom-to-be on the ice. Very romantic! Of course, babymoons are not just for first time parents. If you're a veteran parent trying to figure out how to sneak in a babymoon with kid(s) at home, you'll be interested in the Mohonk Kid's Club. The Kid's Club provides plenty of fun and exploration for your little ones age 2-12 while you and your partner enjoy some time together. My five year old daughter thoroughly enjoyed her time at Mohonk's Kids Club and was very sad to leave on our last day.